In this article I’m going to show how you can use SQLite as a Local database in windows phone 8.1 without the help of LINQ. We have written some new posts for the SQLite Database. You can view them using the links given below. They provide a more easy and clear descripition on how to set up, install and use SQLite Database in your Windows app. Data Binding concept, Basic SQL query knowledge. Create a Windows Phone 8.1 XAML application. Before we can use SQLite in our project, there are some things that you need to have in your project reference. The SQLite SDK, wp8.1 version. You can download it from here. Then add a reference to the SQLite SDK in your app. SQLitePCL nuget package. 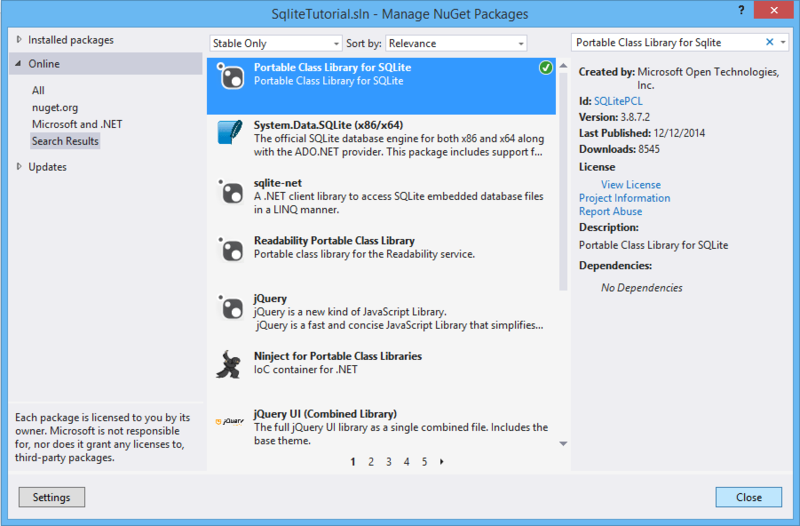 You need search for Portable Class Library for Sqlite in nuget search box. Once the SDK is installed, add it as your project reference and the SQLitePCL nuget package also. There are several nuget packages (wrapper class) available that can manipulate the SQLite database. One of the most common is sqlite-net. We need to know LINQ query to use that wrapper. But in this article we’re going use SQLitePCL. In another article I’ll show the use of sqlite-net. The advantage of this wrapper is that we can write ‘traditional’ query to use the database. And disadvantage of this wrapper is that it has no official documentation. Basically you’ve use it on a ‘test & trial’ basis. But this wrapper has many functions available that is easy to code. Once you’re done with adding the reference, you might see a triangle yellow tiny button on the SQLite reference. Change the project configuration to either ‘x86’ or ‘ARM’. Alert should be gone. To illustrate all the queries and functions, we’ll use a separate class for handling the database related executions. So create a class Database_Controller. We’ll now write several static function for our project. The first function should be in our class to create the Database table. As you can see from the code that it’s pretty straight forward. You just need to create a connection and pass the query. Step() method basically executes the query. Another common query is to insert data into database. So the next function will does the job of adding data. The only thing that I need to explain for this function is ‘Bind’. You can see that in query instead of real value I put ‘question mark’. This is how database system is kept protected from SQL Injection virus. Database can keep track of how many ‘?’ is put in the query. Then this mark are replaced the by the original value with help of Bind function. And the index for ‘?’ starts from 1. Now another common queries of database system is the SELECT query. There’s one thing new here. Let’s take a look. Though I did not make the ID attribute as primary key, I’m assuming it’s unique. Now that we’re done with queries, we’ll put into our xaml pages. Wait, before we put it into any xaml, we need to create the table first. The best way to create the table in on the launch time of the app. So we’ll put these two lines in the App.xaml.cs file. Rest of the work is easy for you. Create ListView, Bind it to Student ObservableCollection. And see the result. For the demonstration, I implemented the delete function the ItemClick event. The ListView uses the StudentDataTemplate which is defined as Resources at the top of the page. You should implement in your real project with a proper way. The code is behind the function is below. DONE! Congratulations again for completing this task successfully. You can now make the most use of local database. I’d love to get your feedback on this. Download the full source code of this project and use it as an reference. In this post we will discuss how you could move a referential database from app’s local storage (resources) to isolated storage. It is not very commonly used but are very useful in some situations. This is particularly useful when one feels the need to preload the database with some data when the app is first launched rather than creating a new database and inserting values in it. When the amount of data you wish to preload is quite large then it is beneficial to put the database containing the preloaded data in app’s local storage (app resources) and then move it to the isolated storage when the app is launched. You would remember from previous tutorials that in the constructor of the default navigation page we have added a condition that checks whether a database exists. If it doesn’t then a new database is created. So instead of creating a new database we need to move the referential database. Here’s how it can be done. Firstly, while debugging you need to run the app and load it with all the data you wish to preload. Here we will use the same sample application that we have been using in this series. Let us add a few users in the database. You could see that we have added three users in the database. Note: If you are using a windows phone 8 emulator then the path should have v8.0 in it otherwise it should have v8.1 for windows phone 8.1 emulator. I was using an 8.1 emulator so I had to change the path from v8.0 to v8.1. As specified the files will be located inside c:\data\myfiles\IsolatedStorage folder. Right click on project name in solution explorer to add an existing item. In the dialog box that appears, navigate to the folder containing the copied database and add it to your project. Step 4. Add the method MoveReferenceDatabase() to the MainPage.xaml.cs of your project. This function copies the specified file from app resources to isolated storage. We will call this function instead of creating a new database when no existing database is found in our project. This function is executed only when the app is run for the first time or whenever no database is found. In the constructor of MainPage.xaml.cs where we check for the existence of a database, replace the statement that creates a new database when none exists with a call to MoveReferenceDatabase(). This will copy the database from app’s resources to isolated storage. The name of the database copied should match with name specified in the connection string variable of data context class. The schema of the copied database should be exactly the same as specified in the app. The copied database will contain all the preloaded data in it. You can get the source code from the link below. In my last post I gave an introduction to local databases in Windows Phone. You can have a look at it again to refresh things. I will start from where I left in the last post so do have a look. Now that you have added reference to System.Data.Linq, you can create a local database in your app. The tables of the database can be created anywhere as long as it is accessible globally in the app. Still I would recommend that make a separate class DB.cs for your tables. Remove the class DB that was created in the file DB.cs when you added the class. Also add the following reference in your file. Now our first task is to create a database which is used locally isolated to the application. Since we are going to use the LINQ to SQL data context as a bridge between the local database and the data context we need to create 2 classes as shown below. The screen shot also shows a snapshot of a table whose code is given below. Add this table in DB.cs. The table name is User_details which is just below the declaration for the table. A table can be visualized as a class with attributes which can be imagined as data members. The columns are added in a similar fashion as data members are added in a class. The data type of the column is defined along with the column name. Notice that column ID is defined as the primary key for the table. Next you need to define the DataContext for User_details which is basically used as the database schema to create an instance, copy the code from the below code block as shown in the screen below. Note the DBConnectionString is used to identify the database in the isolated storage. An app could contain multiple databases and you should be able to identify each of them uniquely so each one is given a unique name. Here we will be using a single database so you don’t need to worry about the naming. In our app the table User_details will be referred by the name Users. For each table of the database you need to create its data context. Here’s a screen shot from another app showing how the data context was defined for its database which contains multiple tables. Below InitializeComponent in Mainpage.xaml add the following code which checks if a database exists and creates one if doesn’t. Our function AddUser takes name and email id as parameters and adds a record to User_details table. It uses the UserDataContext to connect to the database and creates a new instance of User_details class (table) and lastly inserts the record. Now that we have created a function to add records to the table, let us make a page in our app where one could enter the details and insert it to the database. Go to solution explorer and add a new page to your project and name is AddUsers.xaml. Create a form with two textboxes and a button as shown below. Add a Click event handler for the button. The event handler takes the text from the two textboxes and checks if they are empty. If the entered name and email are not empty then it calls the AddUser function by creating an object of DatabaseAdd class. The function GetAllUsers returns a IList which contains all the records fetched from the database. We have set up the connection using the data context and then queried records from the User_details table. The query returns a list of records which is saved to a IList list. IList is nothing but a collection of objects of same type. We define a class with data-members id, name and email. It will be used to hold the details from the fetched records. GetAllUsers function returned a list of records. We call GetAllUsers and keep the fetched records in a Ilist usrs. Now that the function to fetch records is ready, let us create a new page to display records from the database. Go to solution explorer and a new page AllUsers.xaml. Add a ListBox to this page and create its data template. The data template contains two TextBlock with name and email binded to it. These TextBlock are contained in a StackPanel and its tag property is binded to the id. We won’t be needing this tag now but when we need to manipulate the selected record, the id binded to the tag will let us identify the record. Now let us run the project and see if everything works perfectly. In this article I am going to explain how you could use the Isolated Storage by creating a local referential database which can be accessed locally by that Windows Phone application. Database operations could be performed using LINQ to SQL or using SQLite. Usually developers prefer LINQ to SQL for DB operations but SQLite becomes a better option when you plan to make apps both for Windows Phone and Windows 8. Currently Windows 8 supports databases using SQLite only, so if you don’t wish to rewrite the code for both platforms you should prefer SQLite. Before you create a local database, you need to create a new project and add the required references to it. 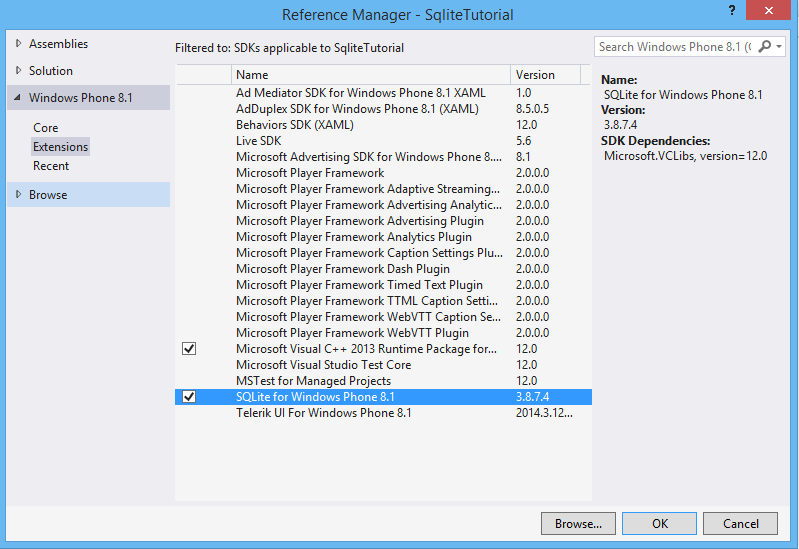 Open Visual Studio and create a black Silverlight Windows Phone app. Browse and choose System.Data.Linq and add it to your project. I am not sure if this reference would be already added. If you are using the latest VS(currently VS 13 update 1) then it may be already referenced in your project as it was in mine. Otherwise you need to add this reference. You could right click on Windows Phone under References to open the object browser and check if a reference to System.Data.Linq already exists. Now you are all set to create a local database in your app. In my next post on databases I will explain how you can create, add and fetch from a database. I will update this post with the links to those posts.